경상남도 밀양 천황산 얼음골에 자리잡은 천황사 경내에 모셔져 있는 불상으로 통일신라시대의 뛰어난 석불좌상이다. 파손된 것을 새로 만든 머리 부분을 포함하여 체구는 인체비례와 유사한 편인데 우아한 어깨, 당당한 가슴, 날씬한 허리에 얇은 옷의 표현으로 사실성을 높여주고 있다. 오른쪽 어깨를 드러낸 옷은 얇은 층단주름을 나타내고 있다. 이처럼 우아하고 사실적인 형태는 8세기 중엽의 불상들과 상통하는 면이지만, 얇은 층단식 주름의 세련된 표현은 8세기 후반의 특징을 보여준다. 대좌는 우리나라에서는 처음 보이는 독특한 사자좌(獅子座)인데, 상대·중대·하대의 3부분으로 구성되어 있다. 상대는 둥근 원판형 윗부분을 약간 높여 정교한 연주문(連珠紋)을 새기고 그 아래에 연꽃무늬를 2겹으로 조각하였다. 중대에는 2줄의 띠를 새긴 얕은 원형받침이 있다. 하대는 복판연화문 위에 11마리의 사자를 환조로 새기고 있는데 정면에는 향로같은 공양구를 끼웠을 것으로 보이는 구멍받침이 있다. 8세기 후반의 가장 우수한 석불상의 예일 뿐만 아니라 유일하게 사자좌를 가진 석불좌상으로 크게 주목되며, 학술적으로도 신라 조각사에서 반드시 취급되어야 할 중요한 불상으로 여겨진다. 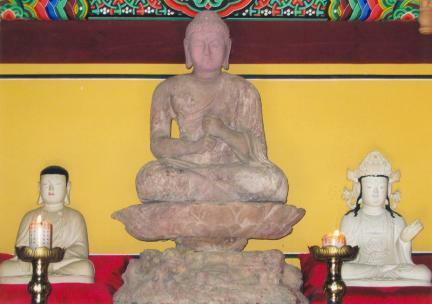 This Buddha statue is enshrined within the precinct of Cheonhwangsa Temple at Eoreumgol Valley of Cheonhwangsan Mountain in Miryang, Gyeongsangnam-do. 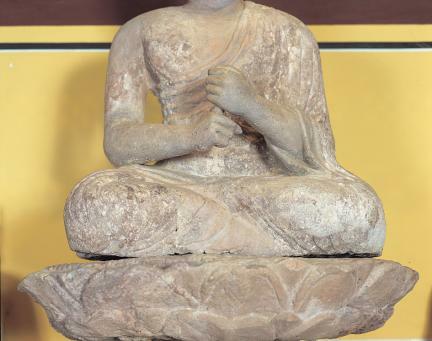 It is an excellent seated stone statue of Buddha made during the Unified Silla. 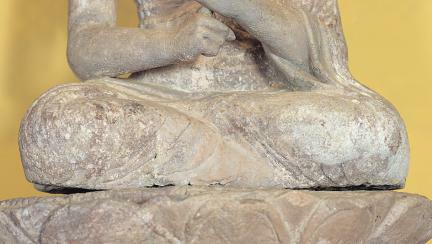 The physical proportion of the statue, including the repaired head part, is similar to that of the human body. The graceful shoulders, imposing chest, and thin clothes on the slim waist are expressed realistically. The robe with the right shoulder exposed has thin-layered pleats. This graceful, realistic shape looks similar to Buddhist statues made during the mid-8th century, but the refined expression of thin-layered pleats shows the characteristics of Buddhist statues made during the late 8th century. 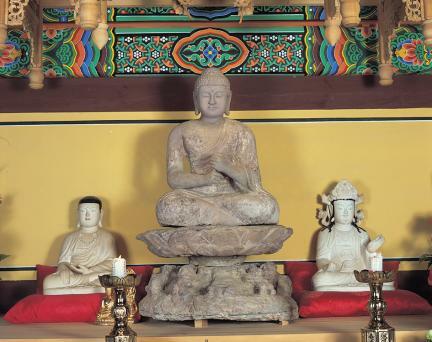 The pedestal is made in the unique shape of a lion seat, found for the first time in Korea. It consists of the top, middle, and bottom supports. The top support has a linked bead pattern carved elaborately on the slightly upturned, round disc base and a lotus flower pattern carved underneath. The middle support has a shallow round disc base with the carving of two lines of belt. The bottom support has the carving of 11 lions on the round base with lotus pattern. On the front side is a holed base into which accessories such as incense burner seem to have been inserted. 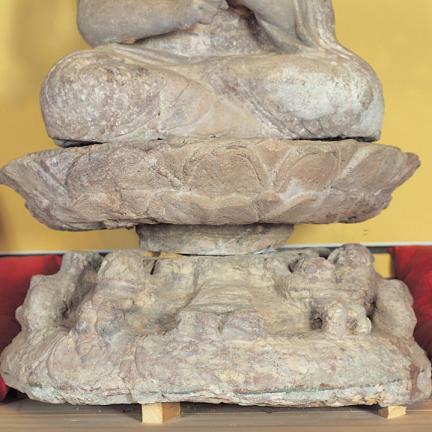 This Buddha statue is considered to be the best one made in the late 8th century, drawing a lot of attention as the only statue with a lion seat. 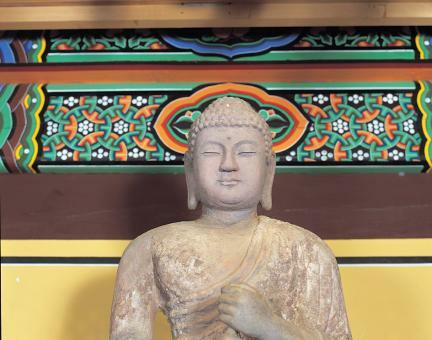 Academically, it is regarded as an important Buddha statue in the history of Silla statues.